These are the two book from ESRI Press absolutely free. Have a look. The Web GIS revolution is radically altering how information about the world around us is applied and shared. This is your learn-by-doing guide into ArcGIS, the powerful mapping and analysis system created by the geospatial pioneers of Esri. 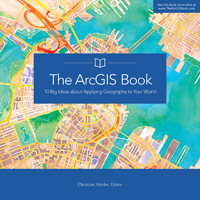 Each of the 10 Big Ideas is a “chapter” about how GIS technology unlocks your data to reveal deeper insights and a better understanding of virtually any problem with a geographic dimension. Click on any map to start exploring and learning; then enable your own free Learn ArcGIS account to create beautiful story maps, mobile apps, web maps, and 3D scenes that you can share online. Explore how imagery and remote sensing power modern GIS. Use this web site and the companion Instructional Guide for The ArcGIS Imagery Book and Learn ArcGIS lessons to quickly begin putting imagery to smarter, more skillful use with your GIS. Everyone will appreciate the wealth of images, and links to powerful web apps and maps, that weave interesting stories about our planet and the issues we face.